This latest figure set from MiniArt is for a group of figures that would fit well in a diorama that takes place behind the front line. 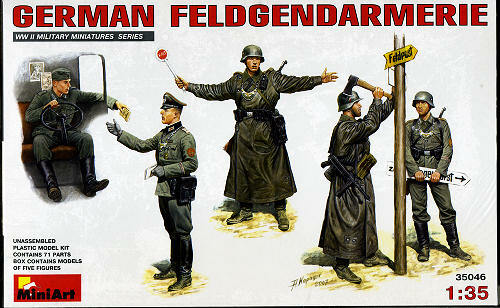 All nations have military police and Germany was no exception. This set provides for that with five figures. Two are attaching new signs to a post, one is directing traffic, one is checking a truck driver for papers and the final figure is the truck driver himself. The figures are very nicely molded and among the 71 parts are all the equipment they will need as well as a number of direction signs. The set includes color printed paper signs to attach to plastic backings, or you can paint your own. As is the norm with many figure sets, there are no printed assembly instructions. Instead, this is included with the painting guide on the back of the box. Paint references from over a half dozen companies are included to help you out in that regard. Overall, an excellent set for the diorama builder or someone who just wants to add some interest to an upcoming project. My thanks to www.dragonmodelsusa.com for the preview set. Get yours today at your local hobby shop or from the hyperlink.